Jay White appears nightly Sunday through Thursday evening at the Le Bistro Theatre in the Riviera Hotel and Casino. White's performance is simply astounding. 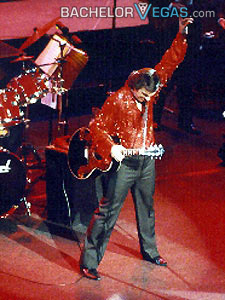 He thrills audiences nightly, as he takes on the role of Neil Diamond when on stage. The thing that makes this tribute concert different from so many others is that White actually looks and sounds exactly like Neil Diamond. In fact, Diamond himself has commented positively on the show and the band of White's, which offer him tribute. This tribute show lasts for 60 minutes and includes songs such as Sweet Caroline, Song Sung Blue, Desiree, and Cherry Cherry. The closing number is sure to be a crowd pleaser, as White ends with Diamond's America. You will love the dedication that White offers in every performance. Due to the popularity of this show, reservations are recommended. If you are looking for a family-friendly form of entertainment children five years old and up are more than welcome to attend. Seen the Jay White Show?